George Oakley made his debut for Hamilton Accies on Saturday. Oakley moved from Inverness for an undisclosed fee late on Thursday, hours after Rice was appointed Hamilton head coach. The former Caley Thistle coach had watched him two days earlier in his capacity as St Mirren assistant manager before vowing to take him to Paisley. Instead, Oakley made his Accies debut as the new era began with a 1-1 Ladbrokes Premiership draw against Dundee on Saturday. “I thought George started really well,” Rice said. “He played the full 90 at Somerset on Tuesday against Ayr United. I was watching him there, he played well and that sort of made my mind up about him, because we were talking about him at St Mirren, I never had the job here at the time. 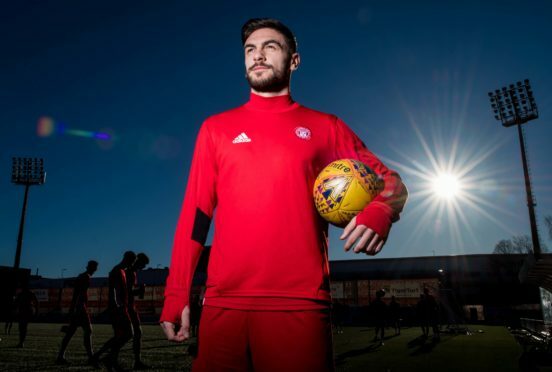 Accies host St Johnstone tomorrow boosted by Darian MacKinnon’s late equaliser on Saturday and a positive response from fans to their performance. Rice will be without Scott McMann against Saints after the full-back suffered a hand injury at the weekend.